Oh my, this is a sobering book to read. It is about how we care and don't care for our elderly and dying community members. 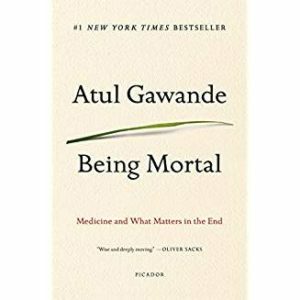 This isn't a data-rich book, it is a narrative well told my Dr. Atul Gawande, a surgeon at Brigham and Women's Hospital in Boston. He uses patients and their true stories to educate us, with anecdotes about the late-life journeys of his patients and his family. He has also conducted considerable research on the topic of caring for our elderly. You will learn the interesting history of how assisted living came about as a counter to nursing homes. And you will learn why. You will gain insight into the motivations of oncologists, other physicians, caregivers and family members who paint overly optimistic pictures ... in service of the search for one more miracle. And you will come to understand some of what is necessary for people who age to continue to have meaningful and purposeful lives. While I am very glad I read this book, I gave it three hearts because I can’t recommend it for everyone ... I have to recommend it with reservation. And the reservation is, pick this up if you are ready to explore this important but difficult subject. If you care for or about someone who is significantly ill, or if you want to decide for yourself with greater clarity what actions should and should not be considered as your time grows short, this is a book worth reading. You will receive a heartfelt education. I read this book awhile ago and had reactions similar to yours. Important reading for sure. My librarian friend, who spends most of her time checking-in books, tells me this is quite a popular book. That’s probably good! This is on my very long book list as well, but I am gong to hold off for a while to read it. I also read this book a while back. I I found it interesting and not surprising in the history and cultural differences on how we treat people during the aging process.